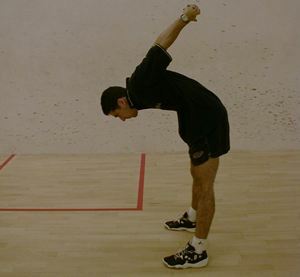 Stretching is an often overlooked but essential part of the package for squash enthusiasts of all levels. Exercise shortens the muscles and unless we take measures to elongate them and keep them supple we leave ourselves more open to the possibilities of injury. 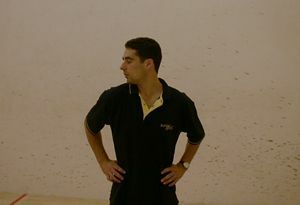 Being more flexible also helps you move more freely around the court, helping you reach those balls that were always tantalisingly out of reach before! 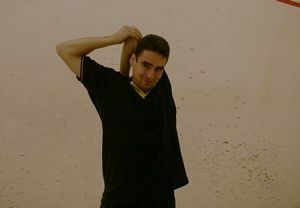 Professionals will often spend a whole training session on stretching alone but I would suggest that about 5-10 minutes stretching before and after you play would be perfectly sufficient for most amateur players. First of all spend a few minutes raising the heart beat and warming the muscles by jogging on the spot or up and down the court (dynamic stretching). Then you are ready to start your stretching routine (static stretching). 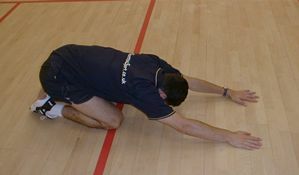 Here is the stretching routine that I normally follow before and after playing. All stretches should be held for about 10-15 seconds. 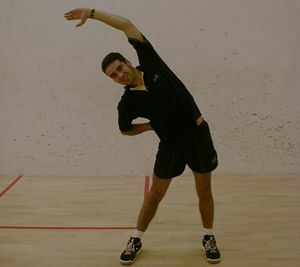 Hopefully these stretches will help you have a longer, more successful and injury-free squash career. Look in front of you and move head slowly from side to side a few times. Look in front of you then lower chin slowly onto neck then backwards to full extension. Repeat a few times. Lower the chin onto the neck then move slowly in that position from side to side. Repeat a few times. Pull the back of one elbow behind your head with your opposite arm. Repeat for the other arm. Clasp your hands behind your back, lower your back and lift your arms upwards. Stand with feet shoulder-width apart, knees slightly bent, put one hand on hip, one hand above your head and reach over to the opposite side. Repeat for other side. Lie on your back, pull your left knee up to your chest and hold it with your right hand. Stretch your left arm up above your head. Stretch to full extension. Repeat for other side. Lie on your back and bring your knees up. Clasp your arms tightly around your knees and push upwards against the force of your arms. Lie on your back, bend your right leg and lay it on your left knee. Put your left hand on your right knee and stretch across to the left side. Repeat for the other side. Get down on all fours, lay your hands on the ground and push your behind backwards, leaving your hands in the same place. Find a wall, bend your front leg and stretch your other leg behind you. Repeat for other side. Lie on your back, bend your left knee and raise your right leg up and backwards. Try to keep the leg as straight as possible. Repeat for other side. Stand on one leg, use a wall to support you if necessary and pull your left foot up behind you with your right hand. Repeat for other leg. Lunge forward on one leg, holding the lunge position. In a seated position put the soles of both feet together, hold your feet and push down with your knees.